New Delhi: The air quality in Delhi witnessed a slight improvement on Wednesday as people are celebrating Diwali across the city. According to the Central Pollution Control Board, the air quality slightly improved but was still under the 'poor' category with an AQI of 277 at 1400 hours as compared to Tuesday's ''very poor'' wherein the index was around 340. The little increase in the wind speed and less moisture can be the reason behind this while it depends on the usage of firecrackers towards the evening, which might affect the situation. Relative humidity was 60 percent at 0830 this morning, lesser than what it was on Tuesday. The amount of humidity in the air also has its effect on the pollutants. Lesser the humidity, helps more in the dispersion of the pollutants, as per experts. However, in view of the hard-hit air quality in the capital and amount of air pollution, the agencies monitoring and preventing the same are on toes to ensure the factors that add to the worsening effect on the air are kept at bay. Police is also on alert to prevent the use of firecrackers in the national capital as per the directions of the Supreme Court in this regard. A large amount of firecrackers have been seized by the Police from across the city in the past days after the apex court's direction came in, while several people who were found in possession of the firecrackers were arrested. Vehicles entering Delhi are also being monitored by the Traffic Police, those not destined to Delhi have been diverted to alternate routes by-passing the capital while large numbers of polluting vehicles have been prosecuted accordingly. 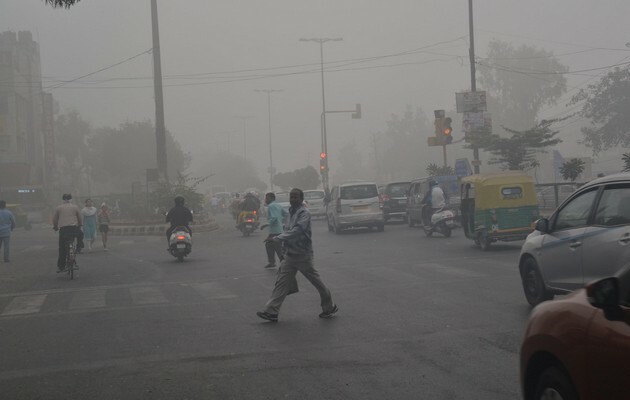 Delhi Environment Minister Imran Hussain on Tuesday had also appealed to citizens of the national capital to celebrate a cracker-free Diwali in view of the rising levels of air pollution and worsening air quality.